The quandary of whether this term should be included in Wikipedia.org now has my attention first, is it fair game to use this term in Wiki? There are two links on the Encyclopedia Wikipedia.org site, one of for the book and the other is for the term. Well, this is good; the Wiki does have Euro Trash. All these phrases are analogous to the “Ugly American,” in usage, I use them all the time, I for sure use Euro Trash, I enjoy stereotypes, it dis-enables the power the European mental midgets believe they have over me… People call you a name, you defend yourself, but the only true way is quid pro quo, you need to give them back the same. The Encarta dictionary defines "Ugly American" as stereotypical offensive American: a loud, boorish, nationalistic American, especially one traveling abroad, who is regarded as conforming to a stereotype that gives Americans a bad reputation. In contrast, Dictionary.com defines "the Ugly American" as: Pejorative term for Americans traveling or living abroad who remain ignorant of local culture and judge everything by American standards. Fun stuff this “Ugly American” term and closely related to racism, but not the same. 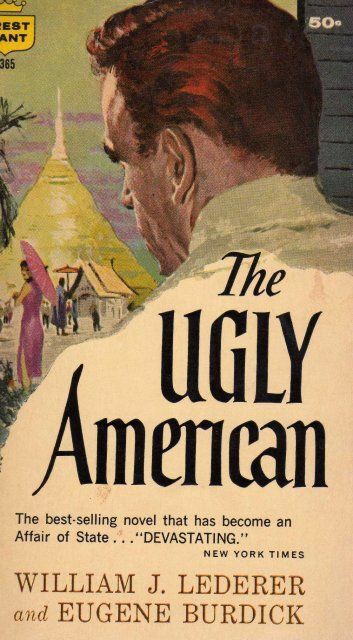 Anyone who uses the terms the “Ugly American” needs to take great care, or they will expose just how stupid they are, I can tell instantly whether they have read the book. Why am I talking about this, well, the stereotype of loud, boorish Americans does exist. There are archetypes for this behavior in a few major groups. 2. United States Embassy People. 5. The lovely youth of the USA going to Europe as Backpackers. The Etymology of the Archetypes that created these stereotypes is my muse; I need to visit more and more countries until I know how the world works… Hehehe. 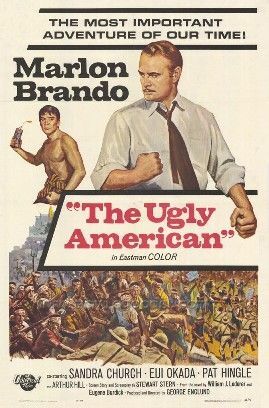 Use this phrase the “Ugly American” with great care, if you are going to use it, please read the book and watch the movie first. I just purchased the Movie on Amazon.com, I have been waiting for years to see this movie by accident, and I am forcing the issue. Someday, I will understand more about the Stereotype of Germans in Rubber pants, and why this is a stereotype. I will wait until Wiki decides to include, all if fair game when we start down this slippery path. I am going to watch the movie on about October 25, I will then revisit this subject with more zest, armed with more and more stereotypes misuse, abuse and provoke you brain from sleep mode to run, many of you are sleeping, wake up, feel the flowers. There is nothing better to wake a sleeping brain than to use words in a twisted manner, truly a joy to a person who wants to talk. Truly an annoyance when the PC Police - "Politically Correct Police" catch us. Heaven forbid I misspell a word, that would be a sin, or include a sentence fragment, you would have to take your mind of cruise, step on the brake, wake up! I watch half one time, sort of slow movie "The Quiet American." I also purchased it on Amazon, and have now included in in the Amazon story so people can buy. Truly this store is expensive, but a great way of showing products. I suppose on the books it is cheap, but the gear is normally double or triple what I pay. I am going to add movies, books, etc as I remember. Truly the phrase the Ugly American is cliche, truly is just an insult, used by non-Americans to try to make a clever insult. 99 percent of the people who use it are just copying others. However, when I revisit the phrase, after I watch the movie. I want to explore who helps to give us this phrase and why. I realized the other day, Soldiers or Military people, or anyone traveling and not paying the tab or bill can be problems. I never feel safe, I always know I can run out of money if I make a mistake. I have no big brother with unlimited money to bail me out. The soldiers have this, they truly are under the wing of protection, they are traveling or with training wheels. Creates a bad formula for culture, a bunch of 20 year old men, drunk, paid, and read to cause a headache. Same for Embasssy, Missionaries, etc. Geoff I could write books on my beliefs why Tourist or Travelers act the way they do. If you want to judge people of a country, you need to go visit the country. I do not like Americans in Europe. I like Americans normally in Guatemala. I do not like Americans in Philippines. I do not like Americans in Thailand. I like Americans in Laos. I like Americans in the state of Indiana, I am not sure in New York or California. I love stereotypes and I in a way agree people should not stereotype. By me describing the Ugly American I create more people who wil use this stereotype. "recently i met a buinessman from north carolina.he was a gentleman in the true sense.head of a large manufacturing concern and a humble man into the bargain." THIS is a stereotype, however what you consider a good stereotype, another person can see this person as a completely different person. People need to recognize the "Stereotype" they like. Please try to recognize the CULTURES you like, try to recognize the CULTURES you love, avoid one and go visit the other. He is a funny, Americans will follow the leader and make horrible comments about the French, however France is one of the first place people want to visit from the USA. Geoff from Australia you also are showing your great love for Americans, generally known as USA type, you do not need to qualify unless in Central or South America. In the end Travelers and Tourist go to tourist destinations they are pointed at, they truly do not know why generally, they are just following some idea told to them. A person must know themselves. I have just spent another 3 months in the Philippines, it is obvious to me that I have a love/ hate relationship with this country. I can honestly say I HATE about half the culture in this country. I can honestly say I LOVE about half the culture in this country. I truly wish it was 50 percent love and 50 percent mildly annoyed, but in reality there is some true crap in this country. That is my opinion, that is not the opinion of people who live here, unless they would happen to listen to themselves talking about the Filipino people. I will never write clearly about a culture, it just is not real, it would be a lie, any writer that explains a country as loving, fun and wonderful is a liar, this places is nirvana and it does not exist.